The Town of Washington, Virginia, officially established by the Virginia Assembly in 1796, is the county seat for Rappahannock County, some 67 miles southwest of Washington, D.C. On the second Monday of every month, a group of seven elected town residents who make up the Washington Town Council, meets in the historic Town Hall, circa 1857, to hold a town council meeting. Residents and visitors are welcome to attend. The Town Council governs the town. It is composed of five council members, a mayor and a treasurer, all of whom serve four-year terms. Election for the council members, treasurer and mayor is held on the first Tuesday in May. In its capacity as the legislative authority for the town, the council deliberates and votes on legislation, town programs, budgets and approves funding for town services. The mayor, as chief executive officer of the town, presides over the monthly meetings of the Town Council and votes as a member of the council, but has no veto power. He is the head of the town government for all of its ceremonial purposes. The Town Council, by a majority of its members, elects a vice mayor from its membership to serve a four-year term. The vice mayor serves in the absence of or during the disability of the mayor. The Town Council also appoints a town attorney. In the 1950s, the Washington Town Council made national news when the town elected an all-women Town Council, mayor and treasurer. Sewer Customers: If you notice sewage coming from your grinder pot and the alarm is not going off please check your circuit breaker for your pump and if it is in the off position please turn it to the on position and your pump should come on. If it does not come on please call ESS at their emergency number 540-825-6660. If you have a sewer emergency and your alarm is going off please turn it off using the toggle switch underneath the gray circuit box. The alarm light will still stay on. Please call ESS at 540-825-6660 to report your emergency. Please make sure you leave your name, telephone number, and street address. If you have a sewage leak in the line from the house to the grinder pot that leak is the home owner’s responsibility to have it repaired. These materials may create unsafe conditions in your lines and grinder pump pot or may clog your home system as well. Repairs resulting from damages to the pump station due to improper use will be billed to the property owner. Water Customers: If you have a water leak obviously coming from the meter box or in the street please call the Town during office hours to report your leak or call Country Water Systems at 540-825-2781 during non-business hours. If you have a leak in the water line coming from your home to meter box it is the home owner’s responsibly to have it repaired. 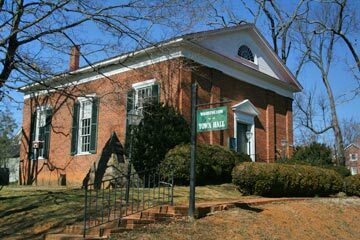 Town Hall, circa 1857, was built as a Presbyterian Church. The Town of Washington has set up five task forces to address issues of importance for the future. These tasks forces address Infrastructure (water, sewer, roads, lighting, sidewalks, etc. ), Business Development (to attract and retain businesses), Tourism Development (to attract and enhance visits by non-Town residents), Housing (as a step towards meeting a more stable population in the Town), and Finance and Administration (to assess administrative needs, finances, and interact with various state and local administrations). For everyone who has seen those UGLY lightbulbs we have installed – They are only temporary! The Town is investigating, with the help of REC and the Dark Skies Initiative, replacement lighting for all fixtures. We can no longer use the high pressure sodium lights. With over 10 of the town’s lights out, safety is our first priority; therefore the temporary bulb. So please bear with us as we take the time to find ones appropriate. 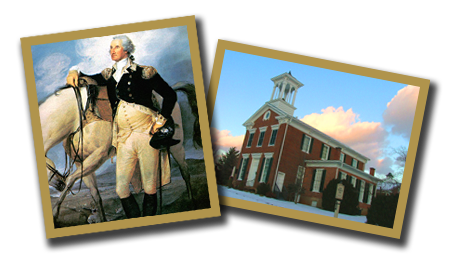 The Planning Commission of the Town of Washington will hold its regularly scheduled meeting on Monday 22nd April at 7:00pm in the Town Hall to discuss upcoming issues related to the Comprehensive Plan and the work of the Task Forces.